So, last time I mentioned my Samsung Galaxy Pocket and told you it was going to be a story for another day. Well, the day is here. That particular phone lasted me less than a year, about ten months. What kind of phone pulls a stunt like that? My first Android and it does that to me. Of course it is as low-end as it gets but I cherished it. I dropped it all the time though. You can’t blame me. It was tiny and always in the palm of my tiny hand all the time so it was expected. When it was not in my hand it was under my pillow, no matter how many times I was told that it is dangerous to keep it there. Never did I drop it in water. But according to one customer care rep at the Samsung Service Centre in Westlands, I did and they needed Ksh 6,000 to fix it. I might as well buy another entirely new phone with only 2,000 more. So much for warranty. I got pissed off, got my dead phone back and moved on. I will tell you briefly why I loved my Shindroid all the same. It was the most resilient thing for a smartphone I have laid my hands on. (Not that I have laid my hands on many but still.) I say smartphone because we all know that Nokia phones are the most resilient phones out there. Drop it, sit on it, soak it in water, it will still come back to life. Perhaps my Samsung was not as resilient as I would have wished it to be seeing as to how it did stop charging for no reason. I guess I will never know. It has great internal memory. Over 2GB usable. That is perfect, even without a microSD. I filled it with dozens of applications that tickled my fancy. 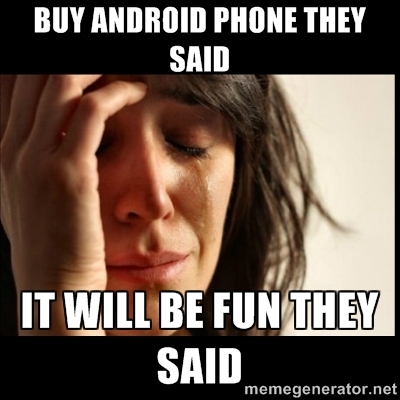 The downside is that the phone comes with Android 2.3 – Gingerbread. Therefore, it is incompatible with a lot of applications on Google Play. I was not going to root it. I know someone (I know you are reading this, you) who rooted his Huawei IDEOS (back in the day when it was everywhere you turned on campus) and did so many other things to it every new day that it just caved to the pressure. In comparison, low-end Nokia phones have the worst memory. Lord! It is like the most annoying memory ever. I am currently in the possession of a Nokia Asha 201 that runs on the S40 OS. Every after a few days, I have to delete anything that can be deleted on it because of the “You seem to be running low on memory” and similar warnings. It has the most useless firmware that is “not available for selection”, at least not in a simple manner. The earlier Nokia phones let you delete weird ringtones and applications. It is no wonder that if you Google how to delete Nokia applications, almost all results are talking about the phones running on S40. That is basically it on my love for my Samsung Galxy Pocket. On to why I will probably never get another Samsung again. It sounded illogical even before I finished typing, but hey, damsel is allowed to bluff. This particular Samsung Galaxy Pocket used to freeze all the time, even when it was new. I thought to myself that that was probably something they all do so I did not make much ado about it. There are times I could type and no words would materialize. I had to either switch it off or put it on flight mode. This happened especially if I connected it to Wi-Fi. It’s a wonder I never dropped it intentionally as I tried to wake it up again. You think those cheesy forwarded texts are boring? Think again. My phone would resend texts like four or even five times and receive incoming texts an extra ten times. I don’t know whether installing Go SMS had anything to do with the cessation of this annoying error but somehow it stopped. Even with my background data always off when on packet data, the gadget guzzled my MBs like there was no tomorrow. I think that is what a smartphone is essentially supposed to do, feed to be smart. The lovely thing about this Nokia phone I use now is the data it consumes. Barely noticeable. At some point I even began to wonder whether Safaricom had stopped charging me. The difference in data consumption is like heaven and earth but of course the direct result is that the experience is better with data consumption. I guess it is true, you cannot have the best of both worlds. The Samsung Galaxy Pocket has a tiny screen. Yes, 240 x 320 pixels, 2.8 inches tiny. I got used to it eventually but some applications would really not give the best with that kind of screen. These include the newer Twitter for Android, Flipboard and Evernote. Again, this is what you get while faking it till you make it. The charger just quit charging for no reason. And it was short. Internet addicts like me need the longest cords to tweet and browse even in bed. Why do you need to tweet in bed? Because the phone is always in your hand, no idle time to leave it charging for over an hour. I do not want to die young. Plus all smartphones have really poor battery life. I hope there are people out there who have sleepless nights in laboratories figuring out how to come up with a battery that lasts longer. Of course if I were rich, this post would not even be up right now. I am still a firm believer in the premise that cheap is expensive. This is the perfect ‘Hujui struggle kama’ experience. Until further notice, I am on Nokia S40. Everyone in the house has a Nokia anyway. Chargers and earphones everywhere you turn. Who said Nokia is dead? This is Africa. Nokia is the only phone a lot of people know and relate to anyway. Rest in peace, Shindroid 1.0.